Sqwiggle, a Mac and browser-based remote workplace and collaboration app, is now free for small teams made up of three people or less. That’s down from $9 per user each month, following a two-week trial. 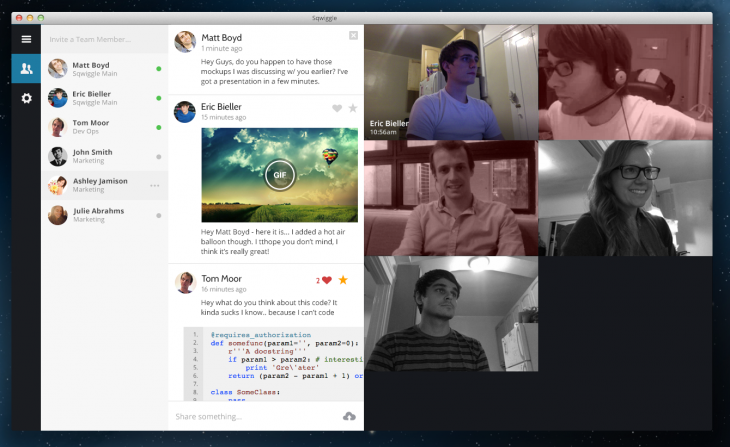 We were impressed with Sqwiggle when we checked out its latest ‘Everest‘ update in October. Contacts are listed on the left-hand side, followed by a chat area with support for file sharing and rich previews of links, code, images, GIFs, tweets and more. Sqwiggle differs from other collaboration apps by taking the occasional snapshot of each team member throughout the day. These are then shown in a large panel on the right-hand side of the app, where you can start video chats with up to four people at once. With red and blue color coding, it’s also easy to see who’s already chatting or unavailable to take a call.